If you have or know about a mining pool for Auroracoin then please post it here and I'll add it to this list. 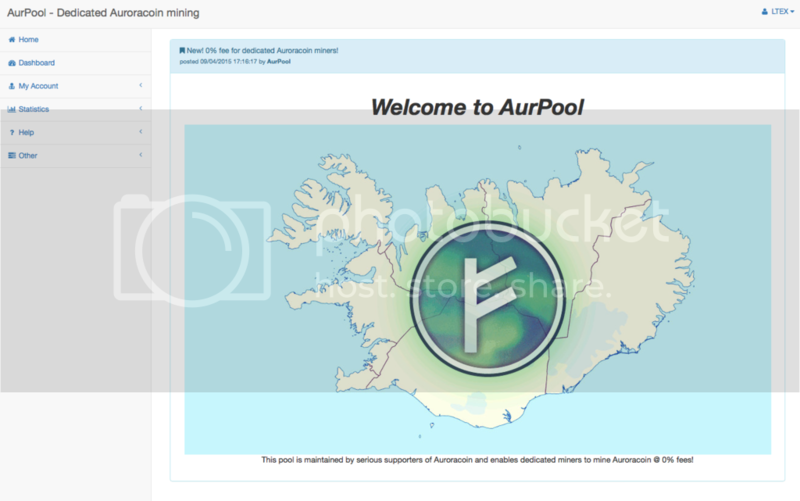 I have been using this pool: https://pool.auroracoin.fr/index.php. I have been mining with my GPU from time to time, just to see how mining works. I've been using multipool.us for the last year or so. I don't think they show it anywhere anymore but it is on port 3362. I have no idea how much they are charging or if there is a much better pool to use, but it has been working for me. bengel wrote: I've been using multipool.us for the last year or so. I don't think they show it anywhere anymore but it is on port 3362. I have no idea how much they are charging or if there is a much better pool to use, but it has been working for me. New pool in town, 0% fees!! I always get "Token expired, please try again" when I try to register. BioMike wrote: https://www.scryptpool.com/pool/AUR lists AUR.